First things first! I awoke to find a lovely message from my sister-in-law. She found the story behind my "rotten apple" photo which is not a rotten apple at all! It was the only surviving artifact from the 9/11 terrorist attack on the twin towers. Here is the story that explains its' journey. Thank you for sharing, Shari!! The Joe's and Cindy went to breakfast down in the lobby; I remained, moving slowly in the room. I did manage to eat a croissant, drink a glass of milk and down 200 mg of Bosulif before they returned. I am pretty sure my good night's rest allowed me to actually leave the room before noon, which is impressive any day of the week for me! Along the way, we came upon the most amazing market EVER!!! They had everything from flowers, to marzipan, to fish of every kind, to ducks with their heads still on them, to legs of animals hanging everywhere. It was so much fun just walking through; probably my favorite thing in Barcelona. Eventually, the guys got us out of the market, on the bus, and to the La Sagrada Familia; where we were told that there were no more tickets available, much to our dismay. The outside was quite amazing, so we decided to at least walk around the entire building. Once we got to the backside, I saw a handicap entrance. I stopped and asked the gal there if there was any way to get tickets. She said "Yes", for tomorrow. I told her that we would be leaving tomorrow and she asked for "my card". I wasn't exactly sure what she meant, but I decided to hand her my Medicare card and my ID. I guess my cane was enough of an explanation because she came back with two free tickets to enter the church! 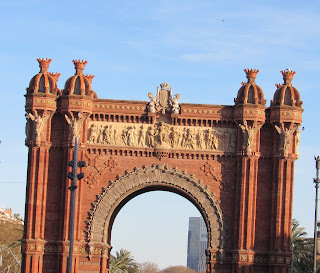 We hopped back on the bus which wound us through the streets of Barcelona enjoying all of the different sights. I must say that there are many different architectural styles represented in this city. Shortly, we arrived at our next stop; the Parc Guell. We had no idea where the parc was, so we just started following the other people on from the bus. Not only was it far away from the stop, but it was almost all UPHILL! NOT a good walk for a person short of breath (due to pleural effusion) or with nerve pain in her feet! All I kept thinking was that I had to walk back, too! Eventually, we arrived at the Parc; you could totally tell that it was the same "mastermind" that designed both of these places, as mosaic "art" was everywhere!. We walked up to the ticket booth and were once again told there were no tickets. They said that they sell out online, please come back manana. Well, that didn't work for Cindy, she went right to work on the poor gentleman telling him, "Do you see that lady over there? She hobbled all the way up that hill to come to this Parc. There must be something you can do!" That's what friends are for, right?? 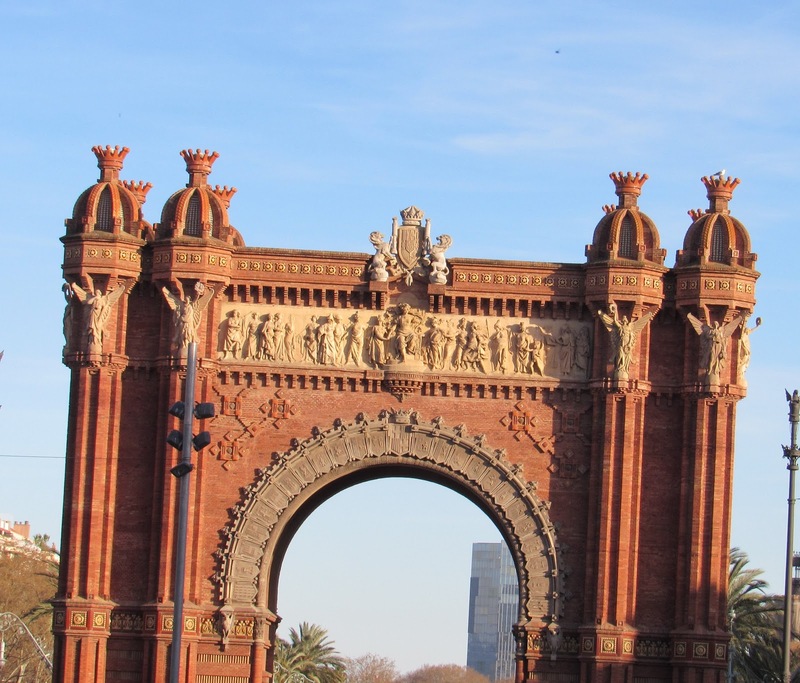 Moral to this story is if you want to see anything in Barcelona, buy your tickets online! I can hardly believe that they were sold out as it was not even crowded in either place. I cannot even imagine what it is like during high tourista season. We did not stay too long and I somehow managed to get back to the bus in one piece. It would be riding the bus and then dinner for me. No more touring around any more weird attractions. We hopped off of the bus when we were somewhat close to our hotel, and headed back to the market thinking we would get some chocolate and maybe an appetizer. When Cindy asked one of the places if she could get an appetizer at the bar, there in the market he said, "Come with me," so like a bunch of lambs to slaughter we followed him in and around and through alleys. Eventually, we arrived at his restaurant! Not exactly what we had in mind. We were seated at a table and a waiter arrived with menus. After looking it over, we were not impressed and just ordered cerveza and water for me. The waiter was so MAD that he yelled at us! This is for "comida" (food), so we said we would order appetizers, or drink our drinks really fast and leave. He came back and told us to order appetizers, and to eat them rapido! lol We ordered croquettes, which were delicious, and mussels, which I was told we "OK". The BEST one of these EVER! He brought us the check and we were out the door. We walked a few blocks and grabbed some Wok the Walk and brought it back to our hotel and ate in their bar. THAT bartender was amazing; even brought us real plates and silverware for our take-out! Pretty funny, I think. While we were sitting there, with guys drinking more cervezas, I started eating my chocolates. I gave Cindy her coconut one, and sang, "If you like pina coladas" and the lady at the next table said, I have been singing that song in my head ALL DAY! And LOOK, the bartender is bringing me one! We all laughed and had a nice conversation. Tomorrow we get on the ship! First Real Day; New York City! !